Exhibition “Anniversary” is open in the Institute of Contemporary Art, Ukraine’s NAA. The ex­hi­bition is dedicated to the tenth anniversary of the foundation of this art and research institution. The works presented at the exposition show mosaic of authors’ strategies and tactics, many individual gestures, and artistic events. The curators of the exhibition – Iryna Yatsyk, Hlib Vy­she­slav­sky, and Oleh Sydor-Hibelynda tried to gather as many artists of different generations as possible, those artists, who, in their opinion, were the most active in the sphere of modern art. The spirit of the new millennium “hangs in the air” – me­ta­phorical red human figure created by the director of the institute artist Vik­tor Sydorenko. White in­stal­lation by Oleksii Lytvynenko and Petro Bevza which takes up a whole room reminds what a brave step it was to put “wild” natural materials in the exhibition hall. 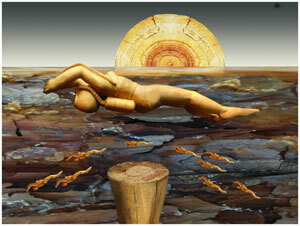 The wooden object by Roman Minin resembles a sarco­phagus, in which all the problems of Donbas miners are buried. Some­how it doesn’t even feel right to use the word “academic” referring to this artistic mischief, however, modern art is worth to be treated very seriously. Institute workers study all the manifestations of the new way of thinking and sensuality that appear on our art arena. It was really impressive how many publications were presented on display stands. In the same exhibition space we can see bright examples of “classics and contemporary artists,” “old guard” and “vigorous young generation.” There are also presented rough and living exhibits, made using the traditional technique, as well as virtual art documentation, which took place “once somewhere,” but, in fact, “recently and somewhere clo­se.” Sculptures and graphics are mo­re and more often replaced with photo­graph, land art with installations, and video art, while painting is going through a rebirth, as well as performance, which seemed to fade away in our country, after it just began to bloom in the early 1990s. Entirely new genres such as graffiti are emerging and only now are being slowly acknow­ledged seriously. We see a variety of names, talents, and trends. We also see artists, who began their artistic career in the spirit of Kharkiv school and later came up on the internatio­nal level (Viktor Sydorenko); those who grew from the new wave of Ukrainian postmo­dern (Hlib Vysheslavsky) and found their individual stylistics (Oleksandr Klymenko); those who are still searching for the “alternative way” like representatives of the plastics trend (Petro Bevza and Oleksii Lyt­vynenko), as well as “new archaic” trend (Oleksandr Babak); the ones who feel confident with new technologies (Oksana Chepelyk); and, finally, those who entered the artistic life in the past decade responding more sensitively then others to its bizarre pulsations (Andrii Sy­do­ren­ko, Hamlet Zin­kiv­sky, Roman Mi­nin, Yurii Kruchak, and Dmytro Korniienko). The exposition is completed with the media project by Hlib Vysheslavsky, Virtual Museum. Objective look at all the participants of the process of modern art crea­tion can be compared favorably with the one, which strictly filters artists leaving out of a thousand only dozens of those looking promising in the eyes of art business dealers. Commercial approach to those “chosen ones” exhausts them and doesn’t make them any better. Looking closely at the variety of works from different parts of Ukraine you understand how many interesting and talented individuals didn’t get into those top rankings, always presented in art advertising. Photos of land art compositions in midst of beautiful scenery of the Carpathians and Vinnytsia (report by Oleksii Malykh, Oleksandr Nikitiuk, Hanna Naduda, Hanna Sy­do­ren­ko, Serhii Yakunin, Kostiantyn Alieninsky, and Volodymyr Nois) strike with their beauty. Photo do­cumentation of Hurzuf Seasons by curator Olesia Avramenko reproduces the interesting experiments of different artists in urban environment. Along with retrospective projects by well-known artists the new ones are presented. Thus, fierce abstractionist Oleksandr Klymenko presented pieces of paper printed on a computer on which he expressed a new philosophical view on modern time. Photo installation by Olena Holub Rising of the Wooden Sun, that was presented at art festival in Hungary, is exhibited for the first time in Ukraine. Both fascinating and ironic mood of these works has also a culturological connotation referring to the famous painting by Claude Monet, Impression. Sunrise, stressing the fact that times change.